Written by Sarah Gambell (PhD candidate in Information Studies). Working on my PhD, I’ve had a lot of practice developing my “elevator pitch” about what I actually study. This focusses mainly on the Middle East. Given the current geo-political climate of the Middle East, there is an immediate need for museums to digitise inventories and collections, and to install pre-emptive measures against the destruction of collections. Widespread digitisation of inventories and artefacts reduces the future risk of theft of movable heritage as well as providing a means for continued public access to the works in cases where the item is displaced or destroyed. 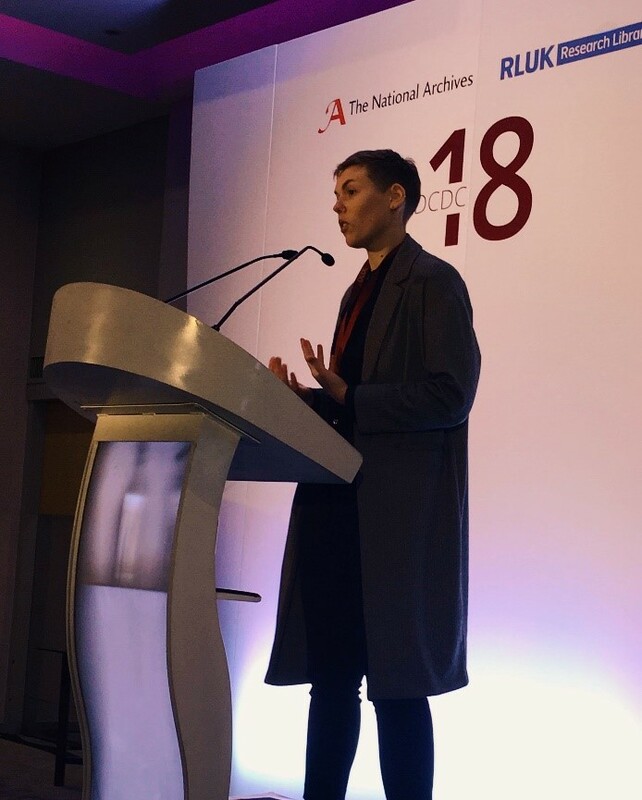 In November I attended the 6th annual DCDC18: Memory and Transformation conference in Birmingham, where I undertook my first conference presentation as a PhD candidate. 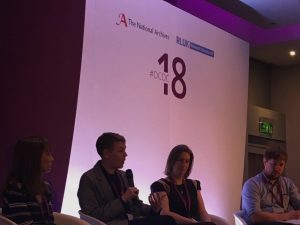 Discovering Collections, Discovering Communities (DCDC) is a collaborative conference series between The National Archives and Research Libraries UK, and the theme for 2018 looked to better understand how heritage organisations can have a bigger impact on the cultural sector. With so many colleagues to be in attendance, my advisors and I thought this would be an ideal space for my first doctoral presentation. As the first presentation of the second and last day of the conference, I spent most of the day a bundle of nerves. I’ve done a fair amount of public speaking in my life, but this was new territory. The room began to fill up after the morning coffee break, I was unsure exactly how many people I would be addressing. Below 100 would not be an issue, but more and more people filtered in, and the space I was addressing rapidly filled up. My panel was called “Digital memories: preservation, interpretation and re-use”, it explored how digital technologies can be used to preserve and analyse physical collection and trace the impact of the re-use of digitised documents (in my case artefacts) for long-term cultural memory. With only 20 minutes to present, I quickly talked through all my material. Luckily, I finished on time and retreated until the panel discussion. Despite the nerves, I received good feedback on my presentation. The event was a chance to make interesting interesting connections, and very much hope to return to the conference sometime in future to present more of my research. It was great that the College of Arts Research Support Awards was available to help me to attend.